The above is an image of the Parashurama Yantra. Please tell me what does this mean? What numbers are associated with this Yantra? 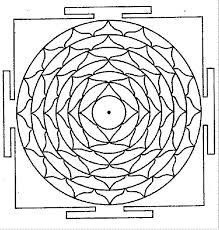 What musical tones or mantras are associated with this Yantra , if any? You can venerate the yantra with simple kumkum or flowers or rice grain etc. ॐ जामदग्न्याय विद्महे महावीराय धीमहि ! तन्न: परशुराम: प्रचोदयात ! Here is a stotra which can be used while worshiping his yantra. Not the answer you're looking for? Browse other questions tagged mantras parashurama yantra .